As the Holy Month of Ramadan is a time focused on giving and selflessness, it's generally a more slower-paced, more modest time of the year in the UAE. However, that doesn't mean there's a lack of luxury when it comes to breaking your fast. Especially in the land of 5* hotels and beautiful Ramadan tents... The UAE's best iftars can be rather grand affairs. Get ready and enjoy an authentic beach-side iftar at the 5* Sheraton Sharjah Beach Resort and Spa's Ramadan tent this month. For just AED 115 per person, it's a lovely, authentic Ramadan experience that is a must-try this month! This 5* iftar buffet includes main courses, salads and international desserts, plus live cooking stations! There's Ramadan drink and beverages, a Ramadan tent on the beach with a panoramic glass wall facing towards the beach. There's also live entertainment with an Oud player, plus the falcon experience and camel ride on the beach. There's also a prayer tent, a children's tent with activities and an Arabic seating arrangement on the beach to enjoy a truly authentic Ramadan experience. For Ramadan 2018, the Kempinski Hotel & Residences Palm Jumeirah have their Majlis Fawanees Ramadan tent - offering an authentic, signature iftar buffet for just AED 155 per adult. The iftar is set in a luxurious and intimate environment at the hotel's Majlis Fawenees tent, which has live music entertainment, complete with an Oud and Tabla player, as well as televisions displaying prayer and Arabic entertainment. Located on Dubai's Sheikh Zayed Road, the Grand Millennium Hotel Dubai are offering visitors to their location a grand iftar this Holy Month. For just AED 114 per adult, and AED 54 per child (aged 6 to 12 years), you can enjoy their lovely Arabic and international iftar buffet, complete with live cooking stations. There's also unlimited Ramadan beverages included, live entertainment, a dedicated play area for your kids and valet parking. This Ramadan 2018, Pullman Dubai Hotel in JLT are offering different iftar options for you and your friends or family to enjoy at their Seasons Restaurant. Save more by purchasing vouchers for you and multiple adults; AED 415 for 4 adults, AED 215 for 2 adults and AED 109 per adult. There's also an option for 1 child at AED 79 each. This iftar includes cold starterss, main courses, a BBQ or roasted meat dishes, soup of the day, live cooking stations, a selection of salads and desserts, cheese and unlimited soft beverages. You can choose between indoor and outdoor seating, plus there's free valet parking! In or heading to Abu Dhabi this month? Head to the iconic Yas Viceroy Hotel to enjoy a lavish 5* buffet this Ramadan at their Origins Restaurant. With different options available - 6 adults for AED 835, 4 adults for AED 559, 2 adults for AED 289 and 1 adult for AED 145 - you can enjoy this brilliant iftar with your whole family and friends. There's an option for kids aged 5 to 12 too, priced at AED 69 each. 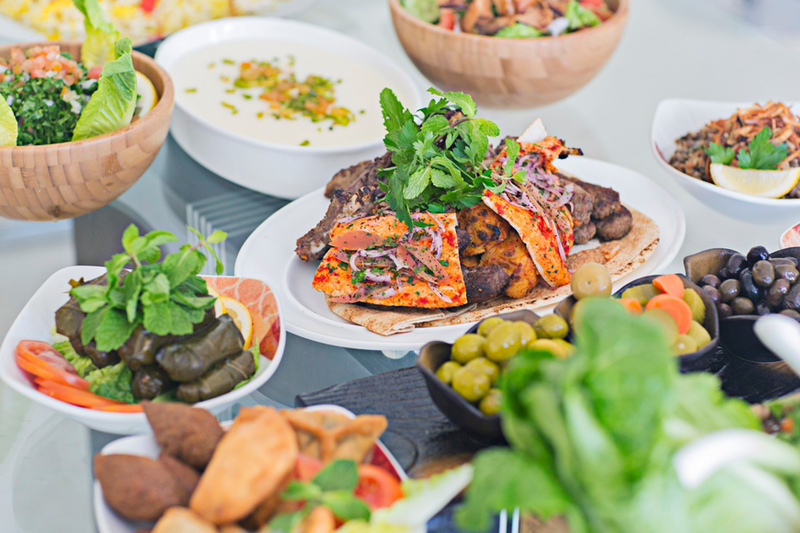 The 5* iftar buffet includes a variety of Arabian traditional and international dishes, a wide selection of hot and cold mezze, as well as live cooking stations, a variety of traditional and international desserts and Ramadan juices. Enjoy a memorable iftar this Ramadan with a traditional feast at Mejhana, 5* Ajman Saray, A Luxury Collection Resort for just AED 119 per adult, and AED 59 per child. The buffet features an extensive array of iftar dishes and Ramadan juices, while you can relax and experience an authentic Arabic experience, cuisine and entertainment. If you're planning a staycation during Ramadan this year and find yourself heading to Fujairah, we recommend you make a stop at Radisson Blu Fujairah to experience their 5* iftar buffet on offer this year. Break you fast this Holy Month with a delicious iftar buffet at this lovely beach-side resort on east side of the UAE. There's option for 1 adult at AED 99, 2 adults at AED 189 and for children from 6 to 12 years, it's priced at AED 69. The iftar buffet includes dates, unlimited juices and Arabic coffee, a range of soups, live cooking stations, hot and cold mezze, an Indian selection as well as oriental and continental pastries.